In this tutorial we will learn to track the in International Space Station's (ISS) GPS location to using Python and Ubidots. We'll be polling this service made possible by Nathan Bergey which will update Ubidots' cloud with the position of the ISS position in real-time. Then, with the raw position data provided, we'll explore how to measure distances and triangulate locations with Ubidots cloud software. 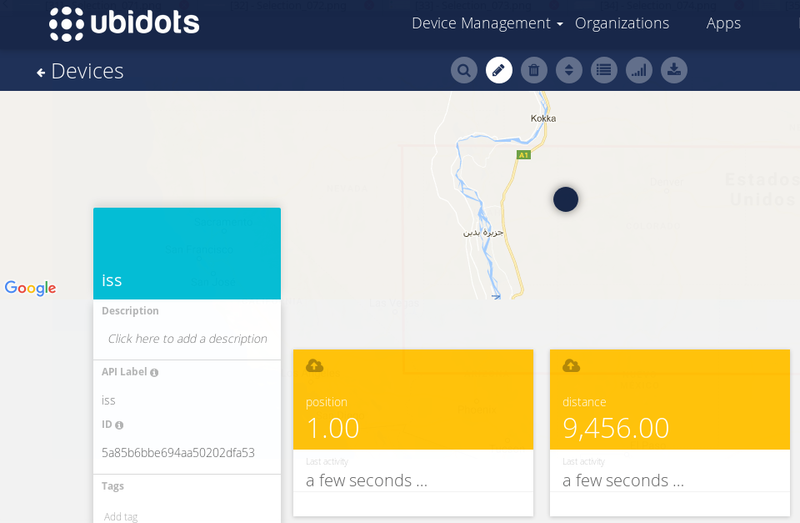 Send date to Ubidots' cloud and create a map on your Dashboard to track the International Space Station in real-time! Then copy and paste the below code in your terminal; assigning your Ubidots TOKEN and location coordinates where indicated in the code. For more information, please see the Ubidots REST API Reference. NOTE: This script is just tracking the ISS position and using a standard formula to calculate its distance to a specific point in earth. It doesn't reflect real sighting opportunities as this depends on more on weather and time variables than simply proximity (i.e. location relative to you). Once the code has been completed with your Ubidots TOKEN and coordinates, press CONTROL + O and ENTER to save. To exit the Python editor, press CONTROL + X and return to the computer's terminal. NOTE: This script is tracking the ISS position and using a standard formula to calculate its distance to a specific point on earth. This will not reflect real sighting opportunities as this depends on more than simply proximity (i.e. time of the day and weather). Now back in the computer's terminal, let's run the script and confirm our work. Paste and run the below script in your computer's terminal. 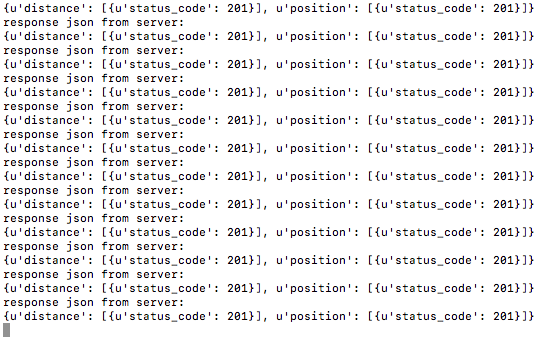 If successful, your terminal will immediate begin reporting server responses.